 Public Lab: Kits Initiative: July! The kits initiative has had a busy spring and summer, and are reviving our monthly Kits report to help keep everyone up to date on what we've been up to, and what we're planning for in the upcoming months. 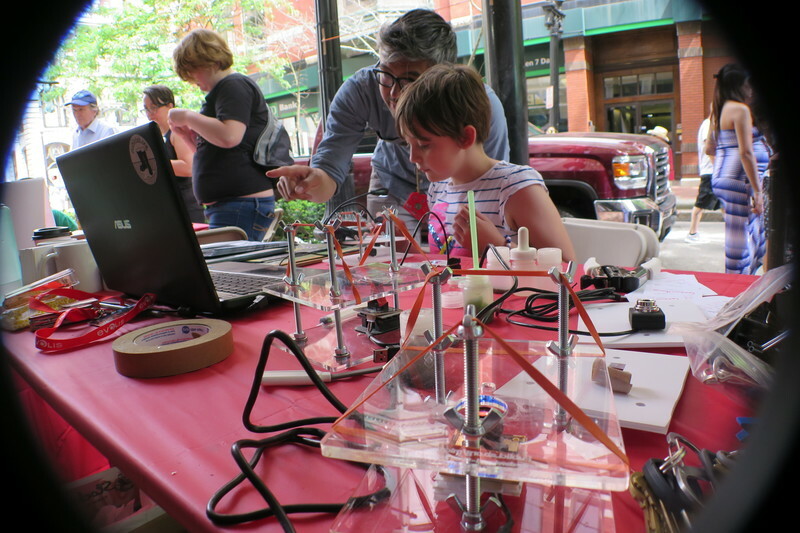 This summer kicked off with Public Lab launching a Kickstarter Campaign to fund-raise for the Community Microscope Toolkit (with special thanks to all of the other open source projects and partners that contributed to its design). We're currently shipping our first round of kits to our earlybird funders, and we're looking forward to seeing how this kit evolves in the hands of community scientists around the world. Stay tuned for further demos, activities and research notes this fall, and look out for some of the excellent work @MaggPi has been doing on imaging with the RaspberryPi version of this kit. We also found time to represent Public Lab at Maker Faire in San Mateo and Providence Mini Maker Faire-- building over 2,000 kits and talking with even more people over the course of two weekends was a tiring but rewarding effort, and after considerable practice we've all managed to beat our own personal best times in spectrometer, microscope and Coqui assembly. We owe a massive THANK YOU to the the volunteers who came with us to make sure that everything came together: @Zengirl2, @danbeavers, @mlamadrid we couldn't have done this without you! In addition to the Community Microscope, we've also introduced some new Community Kits to the online store, and are thrilled to be able to help distribute them to all of you. If you haven't visited our store lately, you can now purchase dataloggers from KAPtery (thanks to @cfastie) the Coqui conductivity sensor (thanks to @kanarinka), the SERC Manual (thanks to @AyakoM and DS4SI) and an expanded selection of tools and materials for prototyping. We're looking forward to working with even more of you to help develop and distribute kits. If you've got an idea and are interested in partnering with us to help share it, please take a look at our Community Kits Checklist and drop us a line! We're especially excited to hear about your thoughts about tools and methods for soil testing, oil and gas research, odor identification, handbooks and publications, and any kind of digital or analogue sensors, but we also like to be surprised! If you think you have something that you think our community would be interested in using, please let us know by posting about online or joining us at any Open Call. Before we sign off, we would also like you to meet BABYLEGS, a microplastics trawl that @maxliboiron will be sharing as a Community Kit. We hope to have this available for pre-order in the coming weeks. Thanks, as always, for all of the ways that you contribute to our open source hardware projects!